Close to Borobodur, the world famous UNESCO World-Heritage Site, Yogyakarta (commonly called “Jogja”), is a sprawling town in Java and one of the most popular destinations on the island. When we started looking for things to do in Yogyakarta, we quickly realised that the town provides an excellent base from where to explore the nearby attractions and landmarks. The town also makes for a convenient stop on your Indonesia trip as it is very accessible and well-connected by land, train or air. There are many places to visit in Yogyakarta itself and within the region, and unlike the more remote places in Indonesia, Jogja is a hub for facilities and home to many hotels, restaurants, taxi companies, tour agencies and other tourist services, so organising trips is easy. 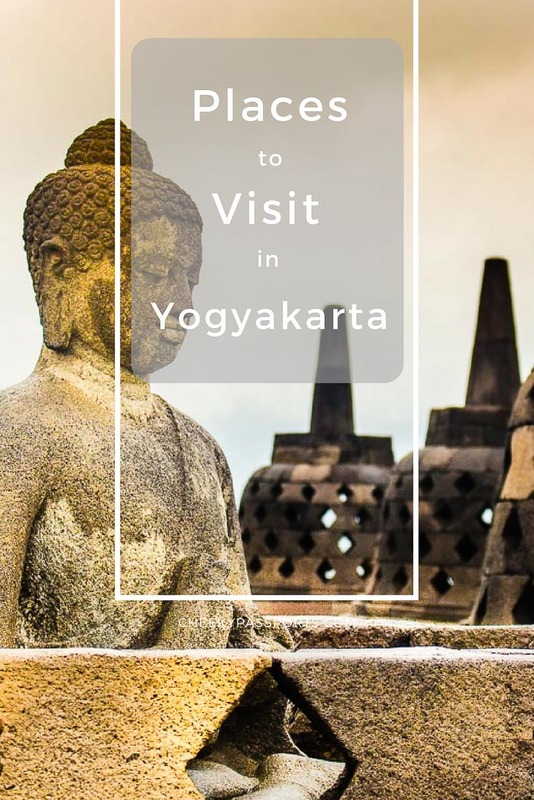 In this post, we are including a guide to things to do in Yogyakarta, recommending places to visit in Yogyakarta as well as suggesting trips out of Yogyakarta. Book your Bus, Rail or Ferry tickets in Java online with Easybook or 12Go Asia. Jogja has its own international airport. Visitors to Yogyakarta typically arrive via the country’s capital Jakarta, located on the same island. The most convenient way to commute between the two is by taking a short flight which can be booked using a foreign credit card on Nusatrip. Frequent trains and buses also connect the two cities. Visitors arriving from Bali can also fly to Yogyakarta from Denpasar airport whilst those arriving from Surabaya can fly or commute via trains and buses. 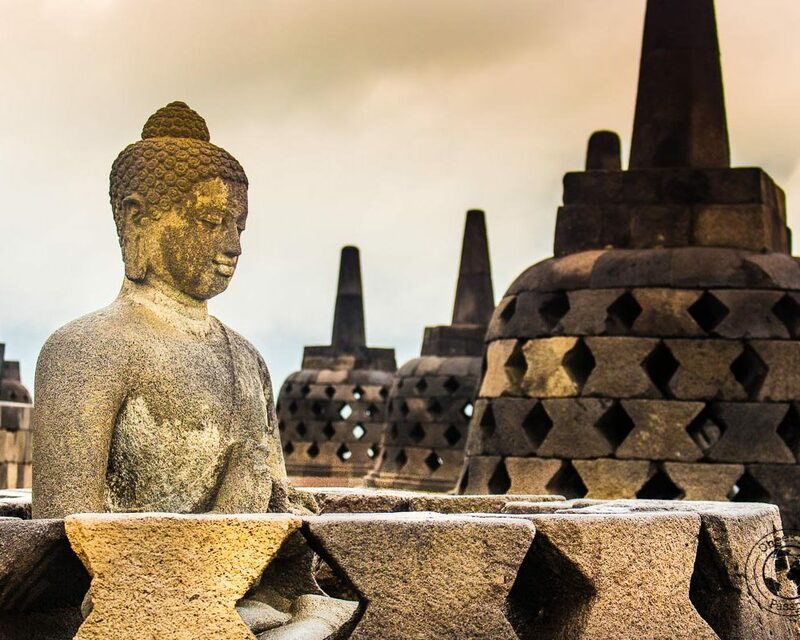 When you’re looking at things to do in Yogyakarta, Borobodur Temple is the attraction which tops the list. 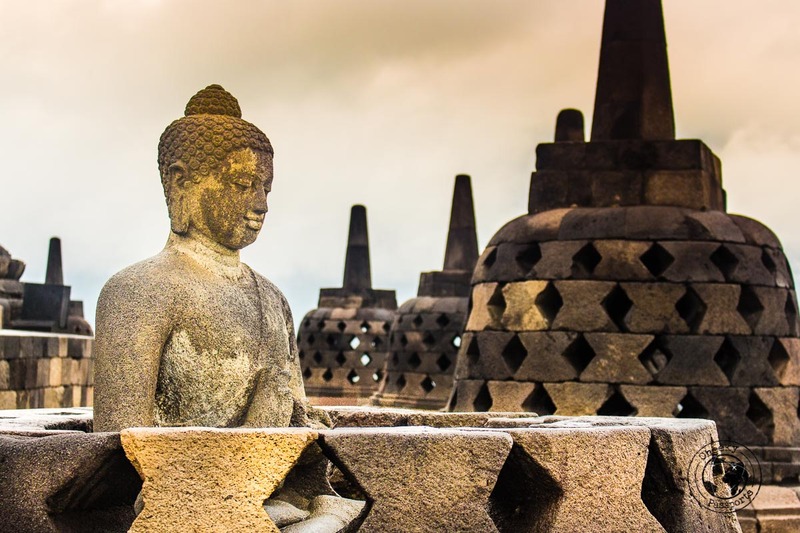 By far one of the most popular places to visit in Yogyakarta, you should know that Borobodur Temple is actually about an hour’s ride away from the town centre. The huge Buddhist temple located in a spectacular setting amidst mountains and is also the largest Buddhist structure in the world. 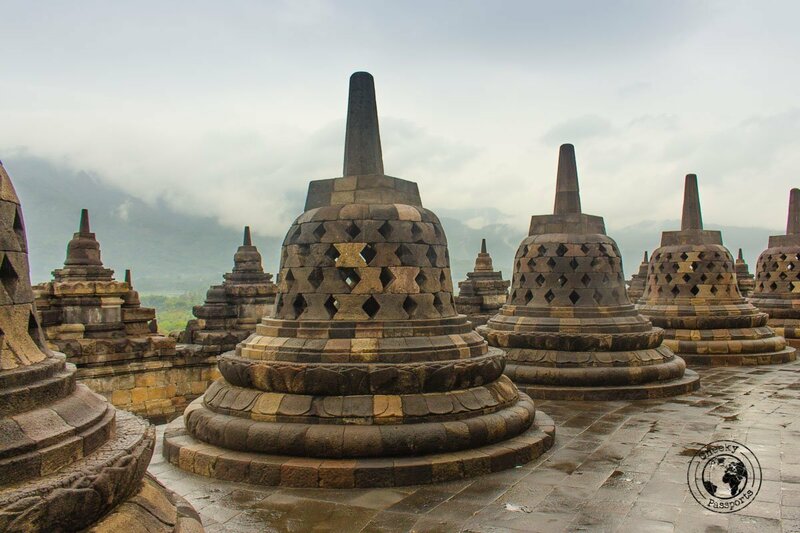 Borobodur is accessible either with private transport, as part of many tours offered in Yogyakarta, and also by public transport, which is surely the cheapest option and the route we opted for. The bus to Borobodur departs from Jombor terminal and the journey takes about an hour. If Jombor is far from your accommodation, getting there is relatively straightforward by connecting to lines 2 or 5 of the local Trans Jogja buses. The bus shelters can be easily identified as they are raised by about 1 meter from the ground and are often manned by ticketing staff. There were no foreign tourists on the bus to Borobodur. Everyone seemed to have used a tour, but we found public transport so convenient and easy to use that we could never recommend going there any other way! The price of the bus ticket from the shelter to Jombor was 3,600 Indonesian Rupiahs (IDR) (about €0.25) each, and the cost of the bus from Jombor to Borobodur bus terminal was 25,000 IDR (about €1.60) each. Going back involved doing everything in reverse, so effectively getting to Borobodur cost us 57,200 IDR (about €3.50) each. Borobodur village is a small typical Indonesian village surrounding the temple. As soon as you descend the bus, you will be welcomed by many ojeks (motor taxis), who will be ready to offer you their best services at a premium price. There’s no need to take an ojek. The temple is located a 20-minute walk away from the bus station – a good way to loosen up your leg muscles after the bus ride! Five minutes into our walk, it started pouring heavily, so we took shelter at one of the many warungs in the main road leading to the temple, where we tasted Gulai, a typical Indonesia dish with meat and a curry-like sauce. The “meat” in the dish was mostly intestines and other innards, but was actually really good! Considering the horrible weather, we were hoping that the complex would be relatively quiet, but no such luck – brightly-coloured umbrellas were everywhere and it was really difficult to get some pictures without an umbrella or two photobombing it! Entrance to Borobodur Temple costs $25, making it one of the more expensive places to visit in Yogyakarta. 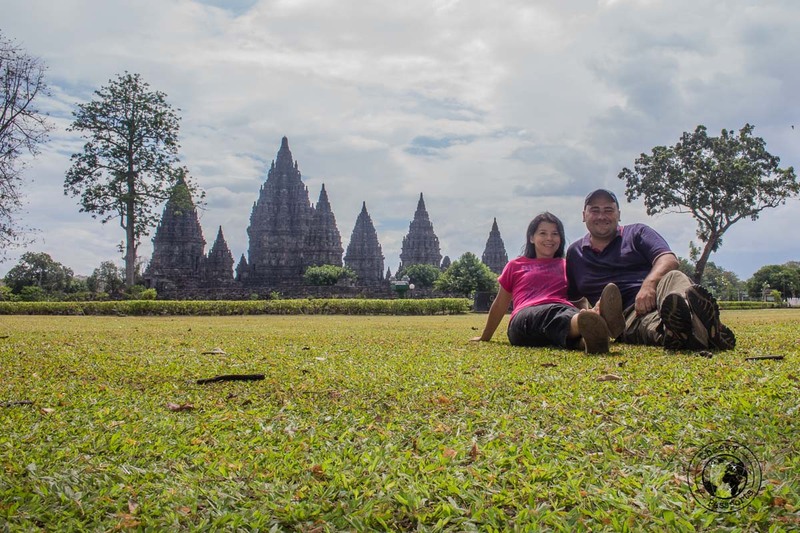 If you’re looking at things to do in Yogyakarta and you also intend visiting Prambanan Temple, it is more cost-effective to pay for a combined ticket to both temples at a price of $40 for foreign tourists (prices are stated in US dollars for foreigners). The combined tickets can be used on consecutive days only. When you’re sorting out your plans regarding things to do in Yogyakarta, be sure to include the impressive ancient Prambanan Temple on your itinerary! The massive Hindu complex is made up of several temples set around the main cluster, all of which are slightly different to each other. The Prambanan Temple is a wonderful example of Hindu architecture – no wonder it attracts a good number of visitors! Although the complex does not attract the same volumes of tourists that Borobodur does, this area can get very busy! Included in the entrance ticket, but often overlooked by visitors are three other temple clusters, a short 10-minute walk from the main area (within the same park boundary). For those wanting a more contemporary cultural experience, the western side of the park has been equipped with an open air stage, offering scheduled performances of the Ramayana Ballet. One should not expect a ballet performance typical of the western style, but rather a traditional dance and theatrical representation of the Javanese court culture. A tour to the Ramayana performance at Prambanan Temple can be booked here. You can get there by private car or by public transport. This temple is a lot closer to Yogyakarta center than Borobudur, and directly connected with line 1A of the TransJogja service. The cost of catching the bus to Prambanan is 3,600 IDR (about €0.25) each way. 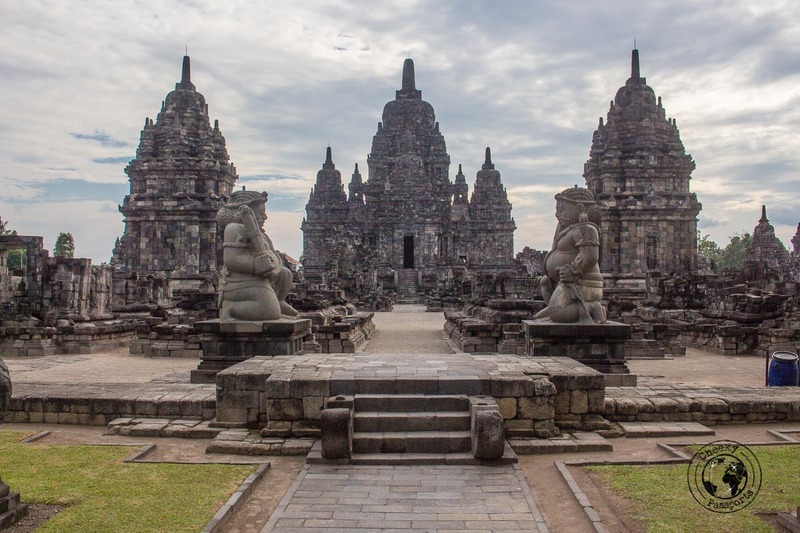 Whilst all the complex is undergoing sectional restoration works, the best preserved structure of the three antennae temple complexes near Prambanan temple is the Sewu Candi (Sewu Temple), which is the one furthest from the main area. We were welcomed to the temple complex by two giant statues, leading the way to the main shrine. While the main Prambanan area was full of group tours, Sewu was practically deserted. 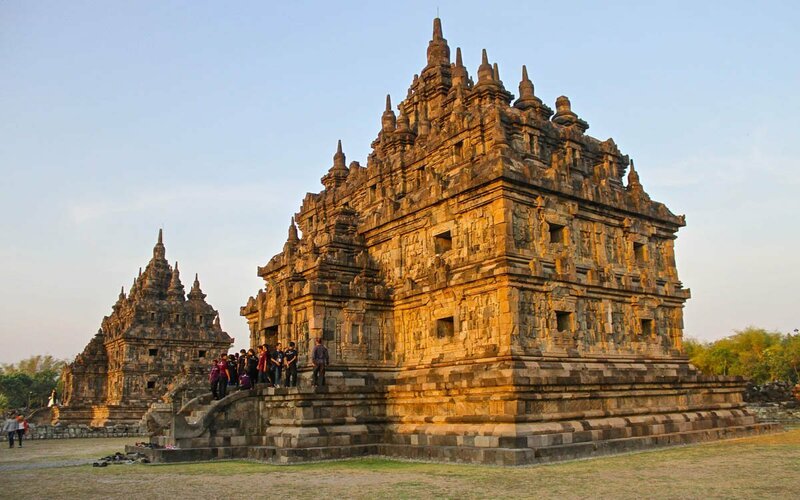 Candi Sewu is the second largest Buddhist Temple complex in Java. 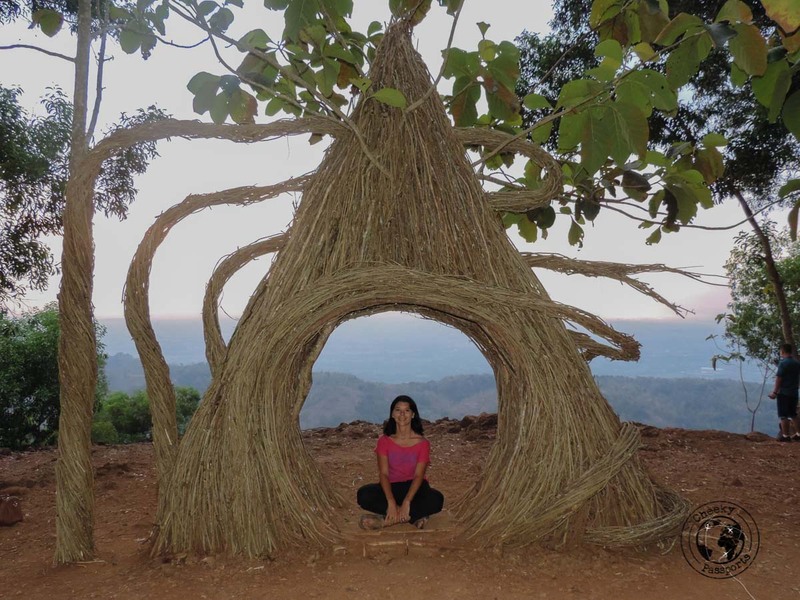 This relatively new attraction, about an hour out of the main town, is a quirky, cute little forested park including sculptures such as “The Hand” which are great Instagram-worthy, photo-spots, especially at sunset time. We got there using Grab at a cost of IDR45,000 (about €3), and wrongly assumed that we would again call a Grab or Uber car to collect us and take us back to town, or at least find a taxi. Little did we know by the time we got to go back, that the region was out of the Grab/Uber operating zone and none were available; we were pretty much stuck there! 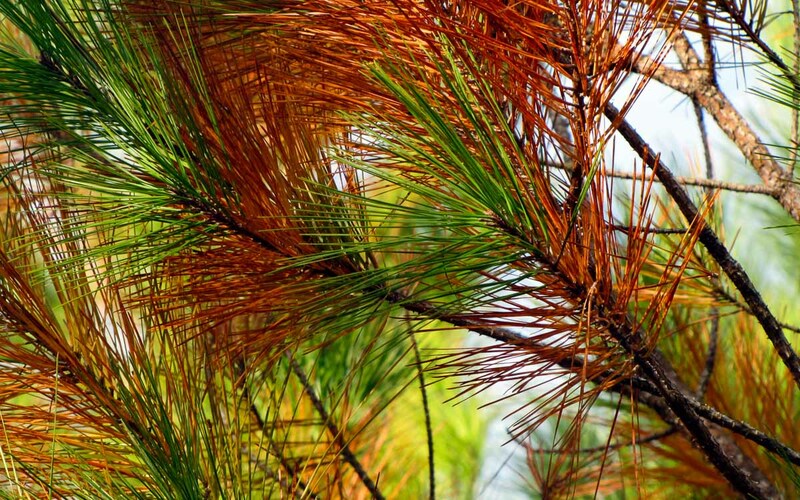 If you are considering putting Pinus Pengger on your list of places to visit in Yogyakarta, we strongly recommend using your own hired car or motorbike to get there, because finding transport back was a difficult adventure! After much asking around, a group of men said they would find us a driver, who refused to take us down to town for less than 400,000 IDR (about €25), almost ten times the proper cost, which was far too expensive for us to consider (they knew we had very little options!). Finally, we decided to bite the bullet and started walking down knowing that making it back to Yogyakarta on foot would take the best part of five hours. A motorbike driver offered us a lift to the nearest town from where he said we could take a bus. Yes, Nikki and I were squashed together on this one motorbike together with the driver, but three adults on a scooter is a pretty common sight in Asia! There I was, pressed firmly against the driver’s back whilst Nikki was about to fall off the other end, with his legs swinging about trying to maintain balance. We didn’t fall off and made it safely, but when we got to the village, we were told that no buses would be passing that way. So we set off and resumed our walking, until again, we were stopped by two guys who offered to take us down to Yogyakarta, using two motorbikes this time. The drive took about 45 minutes. When we arrived in the city one of the drivers demanded that we pay ten times what was originally agreed, toying about with the ‘you don’t understand our language’ scam. Little did he know that we had typed in the agreed sum on Nikki’s phone when agreeing upon the price with his colleague, and we were very sure of what had been agreed upon! After much confrontation, we did eventually pay double the agreed price, but it was still worth paying. We were both tired of arguing, and we got back to the city in time for dinner! Entrance to the park cost 5,000 IDR (about €0.30) per person. 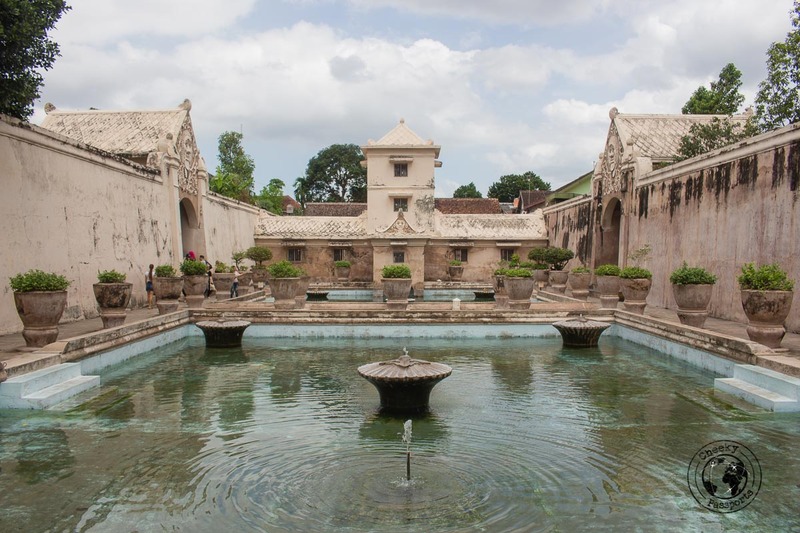 Sometimes referred to as the water castle, this former royal garden is located within the Kraton district, which is the actual royal palace, and is easily one of the best places to visit in Yogyakarta. It is divided into four separate areas, the most interesting of which was the bathing area, we thought. It is hard to miss the bathing area as it is the first section you will come across after entry. It consists of two large pools of water, separated by a three-storey watchtower. Further into the surrounding gardens, it is easy to lose your way to the other highlight of the complex, the underground mosque. Located at the western side (right upon entry) of the complex, it may be hard to find your way to this structure, yet the locals (who actually live in the complex) will be happy to indicate the correct way. 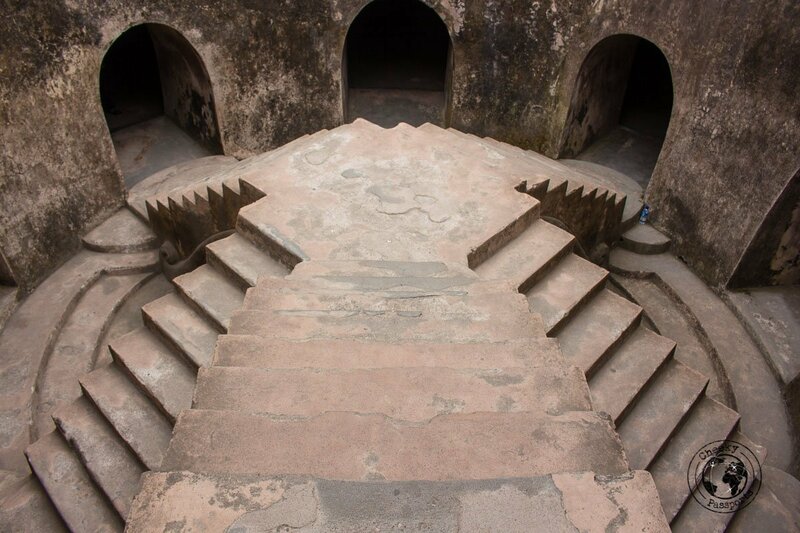 A guard at the entrance will relieve you of a portion of your original entry ticket (you had better hold on to it tightly) and allow access to a steep staircase, leading to a set of tunnels. After a few meters, the tunnels lead to a circular corridor, which in turn surrounds a central courtyard. An intricate but extremely interesting set of steps lead to a similar corridor on the upper floor of this very particular mosque. The entrance fee to the complex is 15,000 IDR (€0.95) per person. 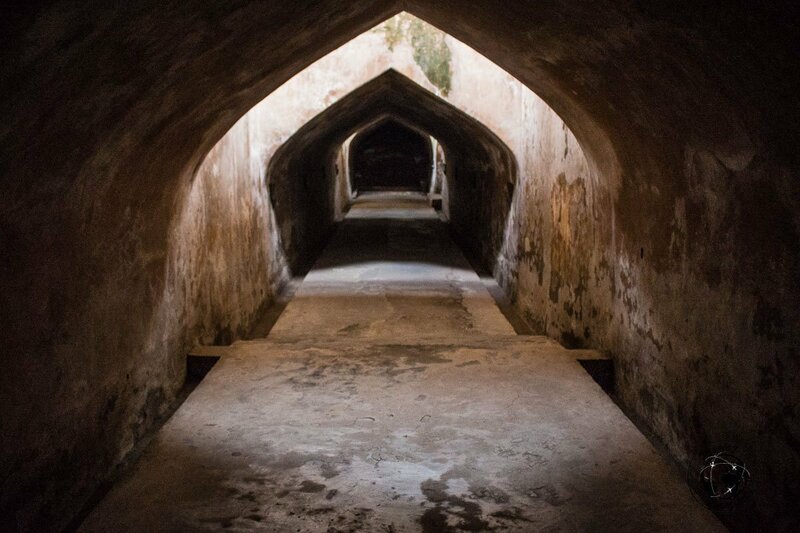 A visit to the Taman Sari and Underground Mosque is often included as part of a city tour of Yogyakarta. Looking for things to do in Yogyakarta by night? Rent a ride at Alun-Alun like the locals of course! 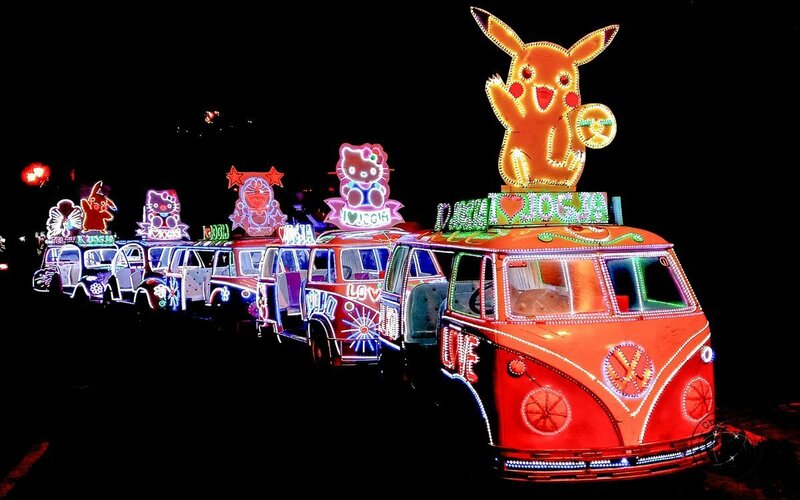 This large square come to life at night when dozens of neon-lit pedal cars featuring “Hello Kitty” and “Doraemon” characters, blaring out loud karaoke music (“Despacito” when we were there), are driven around the square by mostly locals. We personally couldn’t really figure out the fun factor in renting the pedal cars given the loudness of the music, but locals seemed to really enjoy the experience! They were very entertaining to watch! When you’re thinking about things to do in Yogyakarta, beaches might not be on your list, but if you’re spending a few days in the city, you should definitely consider going to the beach especially since the South Java sea is only 1-2 hours’ drive away from Yogyakarta. Many of the beaches do not include tourist facilities so be sure to bring enough food, water and anything else you might need on your day trip. 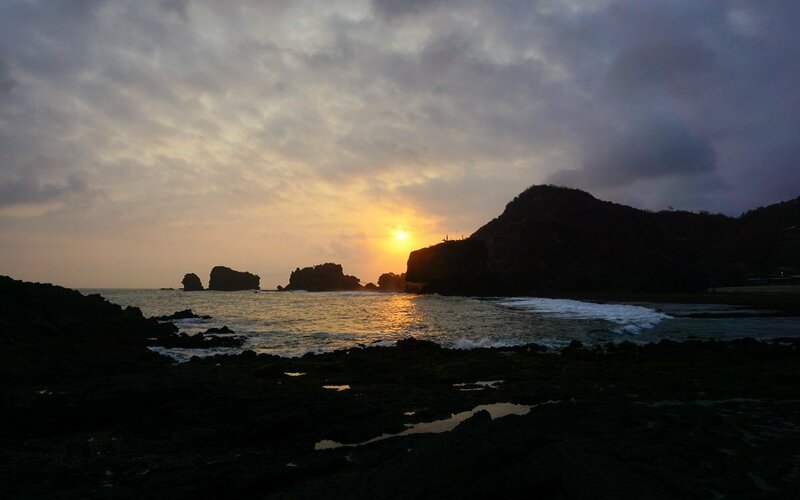 Timang Beach and Wediombo Beach are especially popular and whereas the former offers breath-taking views and a gondola ride to the cliff rock close by, the latter has clean waters and some good waves which is why it is a popular surfing spot in the region. Both beaches are best accessed via private transport. 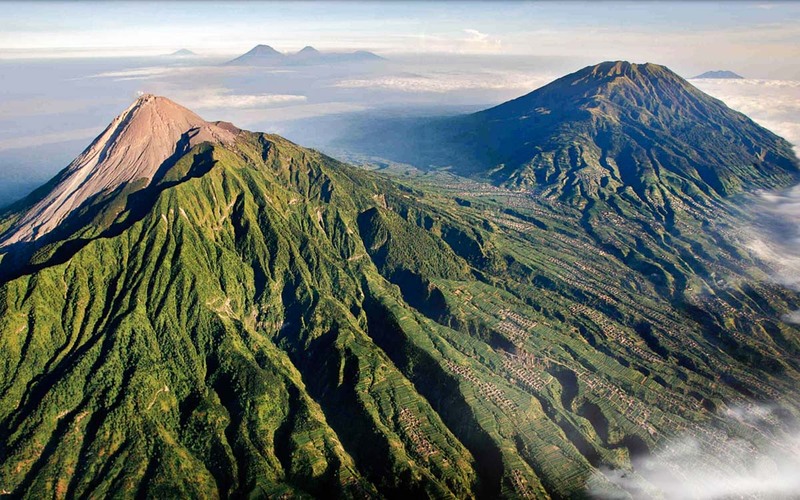 Jeep tours to this volcano are some of the most popular things to do in Yogyakarta, being an interesting way to access the volcano. It is best to negotiate a price per jeep. The more people in the jeep, the cheaper it is per individual. The jeep will also stop you at a museum commemorating the recent eruption, which provides a good insight into the devastating effect of the event. You will also have the opportunity to visit a bunker in which people sought shelter during the eruption. You can get to the museum using public transport but you need a jeep to take you to the surrounding attractions. A jeep tour usually costs anywhere between 300,000 IDR (€18.80) – 600,000 IDR (€37.70) per jeep depending on the package you choose. If you’re feeling adventurous, you can also trek to the peak! 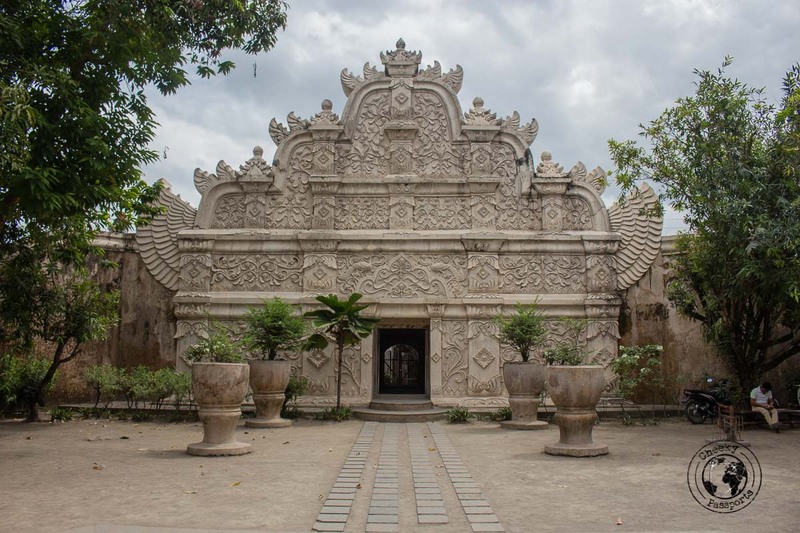 Check out this post for more attractions in Yogyakarta city! Kalibiru is scenic place from where to take photos of some great views. Just like in Pinus Pengger, ‘props’ are set up at the cliff side for some Instagram-worthy shots. You will be charged an individual fee (15,000 IDR/10,000 IDR – € 0.90/€0.60) for taking a picture at each spot. There’s not much else going on, and considering the 1.5 hours’ drive from Yogyakarta, you will need to consider whether this place is worth your time. 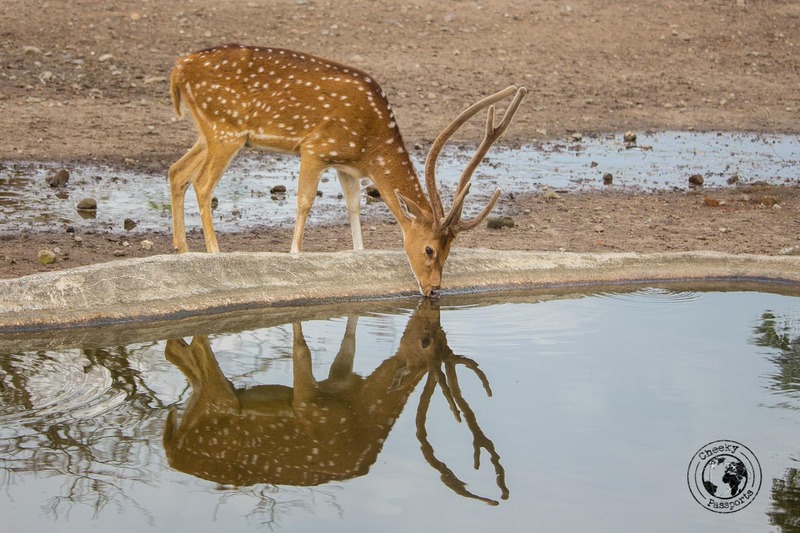 A trip to this park is best included as part of a longer tour. The way up is rather challenging and you might be asked to hire a bike or a 4WD. You can get to Kalibiru by scooter but only if you’re a really good driver since the final leg is really steep. Renting a taxi out of Yogyakarta is by far the best (though not the cheapest) option, since it is normally hired for a full day and will take you to any of the other places to visit in Yogyakarta, depending on your preference. Using public transport is possible but would take rather long and involves a bus change and later renting an ojek (moto taxi) up to Kalibiru. Kalibiru National Park is very popular in weekends and you may need to wait for quite a while to manage a picture at your favourite spot! 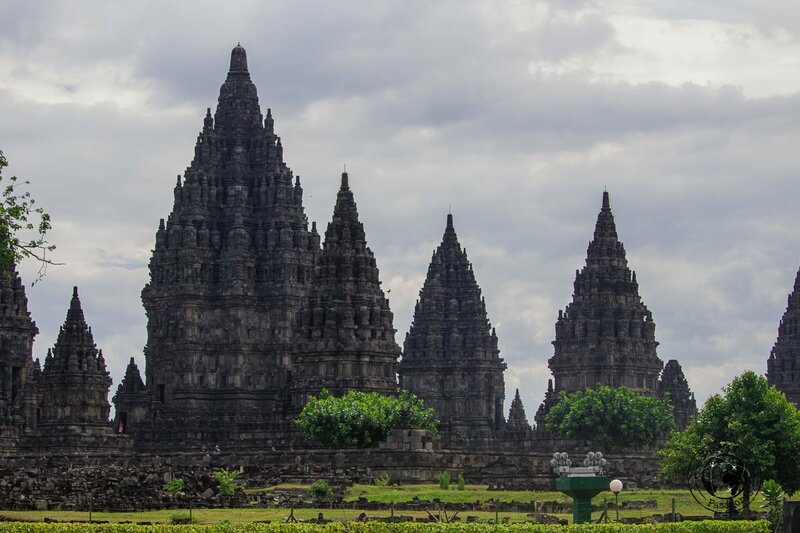 The Buddhist Plaosan temples are a little further away from the more famous Prambanan Hindu temples. They are far less famous but nevertheless beautiful, and should certainly be included on your list of things to do in Yogyakarta. 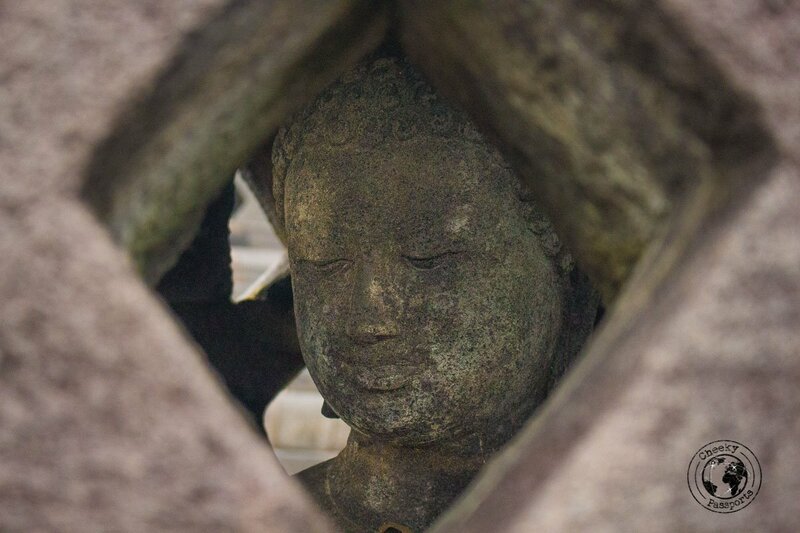 Detailed sculptures are found on the temples which are surrounding by rice fields, making the place rather scenic too! If using public transport, follow the same route for Prambanan temples but walk further (a couple of kilometres) to Plaosan or grab an ojek to there. Entrance fee of 3,000 IDR (€0.20). Situated in Gunung Kidul, a few kilometers away from Wonosari, Goa Pindul offers a relaxing ride in the cave along an underground river on a tube, lasting about 45 minutes. The entrance fee of 70,000 IDR (about €4.25) includes a life vest, torch and a guide who will take you along the cave. You can observe stalactites and stalagmites as you drift along the slow river, and rock formations will be pointed out by the guide. We really recommend that you take a waterproof bag along with you if you want to carry your stuff. This adventure can be combined with the Kali Oyyo and/or Jomblang Cave. Tours can be booked here. It is possible to get to the area using public transport by taking a TransJogja bus from Yogyakarta centre to Giwangan terminal, followed by a bus to Wonosari bus station. You will need to get an ojek (moto taxi) to Goa Pindul. Tubing on the Oyyo River is a little more adventurous and exhilarating when compared to Goa Pindul and can be booked as part of the same package. This ride will take you close to a cliff from where you can practice your jumping skills, as well as a strong waterfall. Tours can be booked here. 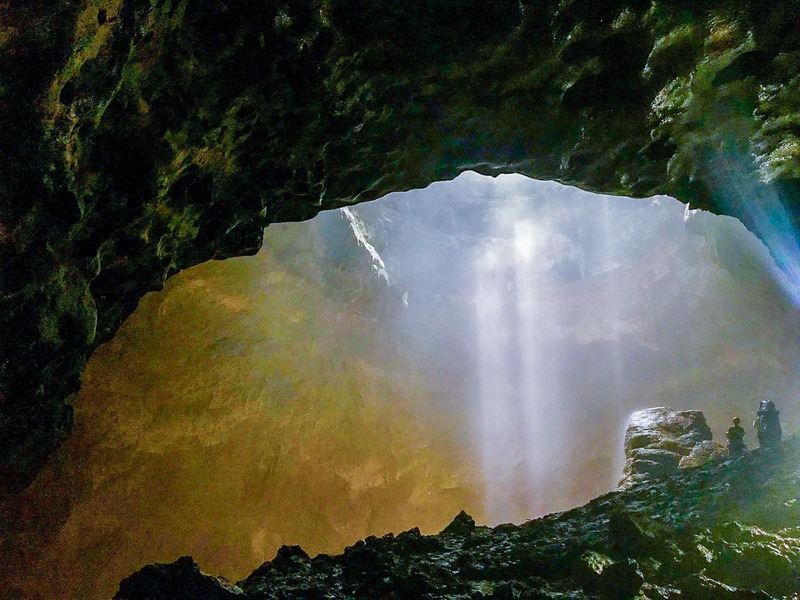 This adventurous activity includes rappelling through a dark, muddy vertical cave to observe the ‘Light of Heaven’ shining through the cave. Boots are supplied, but do wear old socks which you can throw away in case your boots leak! Carrying a flashlight and a waterproof bag is highly recommended! Directions for getting to the cave are the same as those for the activities above. You first need to get to Wonosari city bus station. From here you need to take a bus to Semanu and take an ojek to the cave. Tours are held the morning to see the Light of Heaven, so if you are using public transport you will need to get there a day earlier. If you’re short on time, it would be best to get a tour from Yogyakarta which can be booked here. There’s a limit of the number of people who can visit the cave per day, so get there early if you want to be sure of securing a place! This little pretty waterfall is best reached using private transportation since it is not on the usual tourist route. The curtain of water falls into a narrow gorge in a forested area and is a relaxing place to send some time in. A very relaxing place with some great viewpoints, if you want to get away from the hustle and bustle of the city. 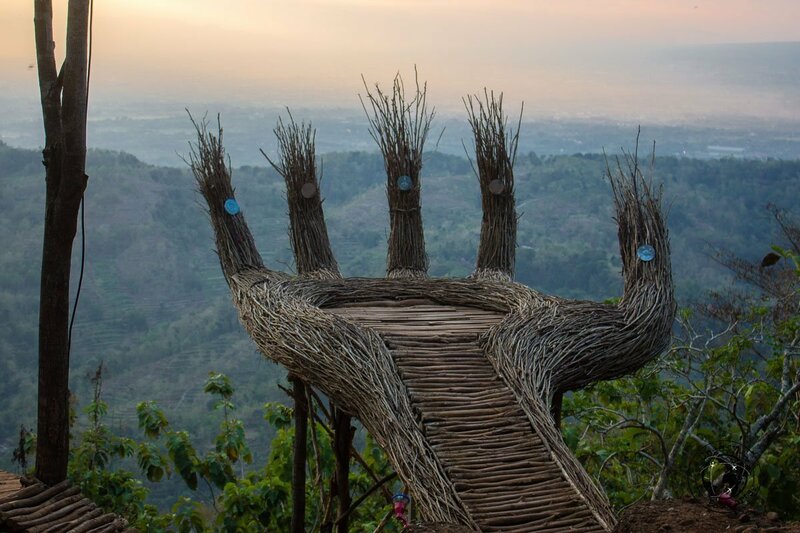 The forest is about an hour out of Yogyakarta city so it is best to visit using private transport. Once again, it can get rather crowded on weekends, so try making the trip during the week if you want to avoid seeing too many people! This private museum, consisting of both an indoor and outdoor area, showcases Java’s culture and history via displays such as fabrics, paintings, statues and photos. The entrance fee includes a guide who will passionately explain all about the exhibits and give some insight into Java’s ancient history. 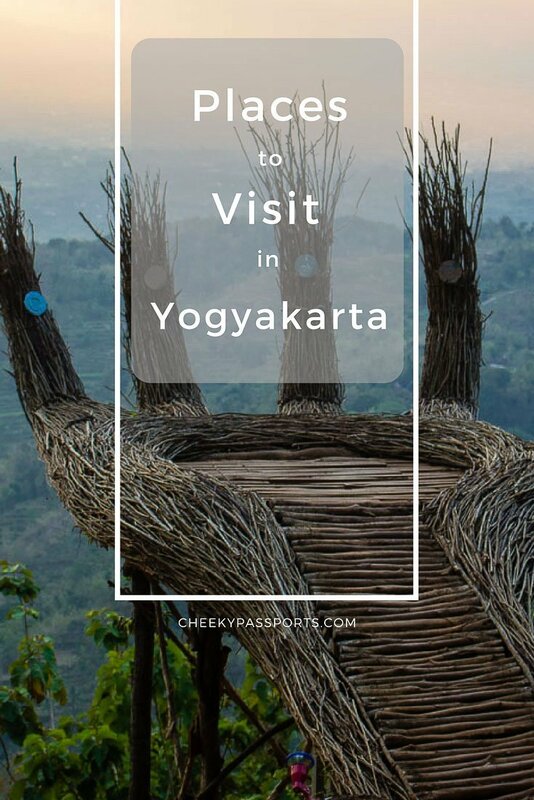 One of the truly unique places to visit in Yogyakarta especially if you would like to learn more about local culture! Our accommodation of choice in Yogyakarta was a relatively new budget hotel called Puri Langenarjan. Although small, the room was great value for money, with a nice attached bathroom and the Indonesian breakfast served every morning was excellent! The location is within the Kraton area and a few meters away from Alun-Alun. Other accomodation options can be booked on Hostelworld, Booking.com or Agoda. This is the main shopping street in Yogyakarta and is surrounded by lots of hotels, restaurants and bars. The area is home to several street-side night restaurants called Lesehan, which are more like stalls set up to a side of the road with long low tables and cushions. 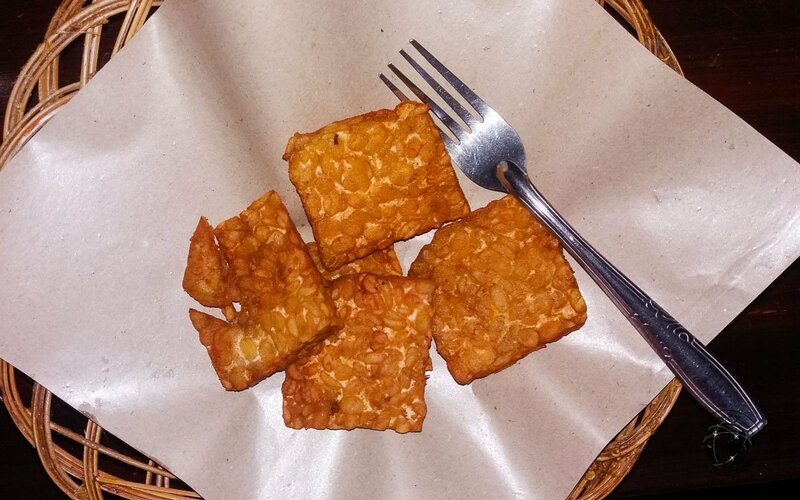 They serve a variety of local food such as the usual nasi goreng, mi goreng, ayam goreng, at affordable prices, which make for a fun and informal local dining experience. Gudeg, a jackfruit stew typical of Java, can be sampled at one of the many stalls. This little warung just a few metres away from the Alun-Alun Selatan was our go-to place for dinner since it was very close to our hotel. Good portions of very fresh local food were prepared and served by a lovely family. The mi rebus (boiled noodles which is actually a soup) was especially tasty and filling, Michelle thought! 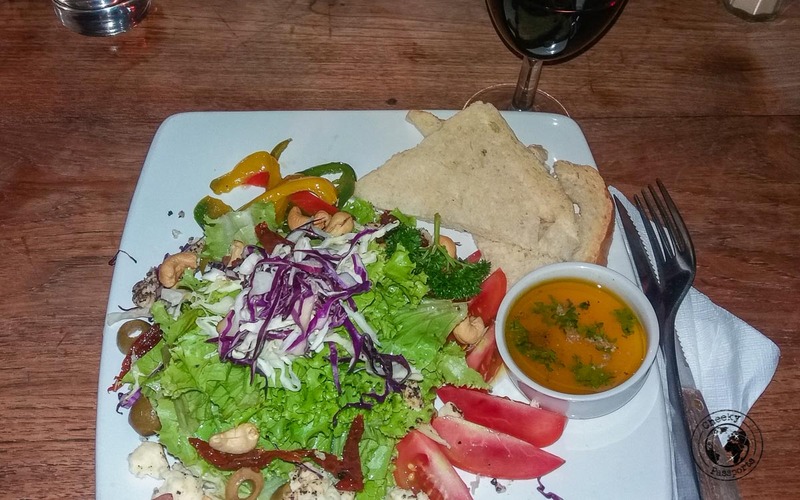 The very popular restaurant serves Indonesian dishes as well as a variety of international dishes which we enjoyed sampling when we needed a change from warungs and we were craving some wine. 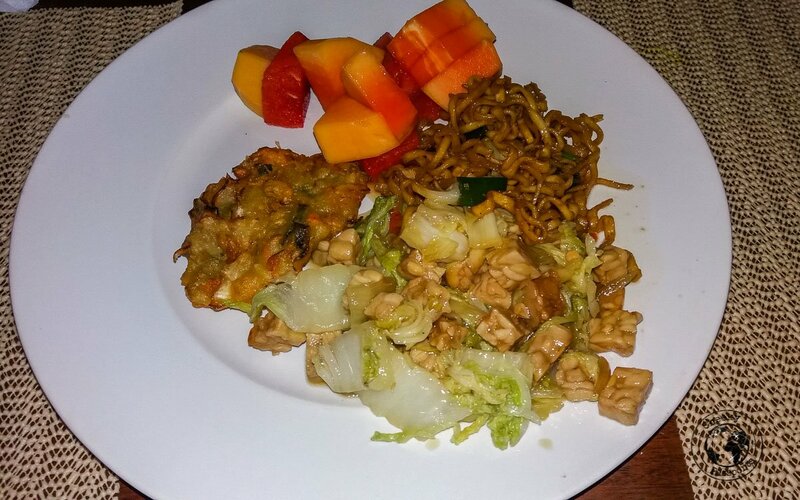 Although a lot more expensive than the local warungs, ViaVia’s dishes were well worth the cost. Besides the items on the menu, daily “specials” are available. We hope you find our list of things to do in Yogyakarta useful! Be sure to check out our other articles about Indonesia! HI Cyril, you should definitely make it a point to visit this place. Its truly mesmerising!